Q: My mom is considering moving to an assisted living in the Boston area, but I am worried that she will be lonely. She doesn’t play cards and is not one for participating in group activities. How will she make friends? The thought of leaving her there alone is making me anxious. A: Moving one’s parent into an assisted living can be a traumatic experience for the entire family. Grown-up children often compare it to the first day of school – only this is a reverse scenario! Remember that feeling when you left your child alone at school or day care for the first time? It’s emotional and nerve-wracking, to say the least. There are, however, strategies you can employ that will help seniors acclimate to a new living environment. First, enlist the help of the Executive Director, Marketing Director and Wellness Director in introducing your parent to other residents. They know all the residents well and can put your mom or dad together with other residents who share similar interests and backgrounds. Meal times, of course, are key to making friends at an assisted living. The staff will place your parent at a table the very first day. If, after a few days, your mom or dad is not happy, do not hesitate to ask – even insist – upon changing tables. Meals are an important part of the socialization process and finding the right table mates is crucial. Sometimes it just takes a few weeks to get the right mix of individuals. 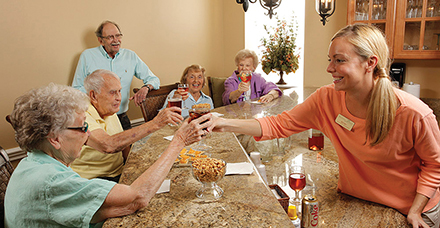 Staff and resident relationships are an integral part of the assisted living experience. Often, these are the relationships that come first and mean so much to the elders and their families. Keep in mind that staff members visit with residents throughout the day, alleviating loneliness and fostering communications. They are also a terrific resource for the family. Most facilities encourage family members to call or email staff members so they can check-in on how one’s parent is adjusting to the transition. Recreational planned activities are obviously a great way to make friends. Some people resist scheduled events and that is absolutely fine. But who doesn’t enjoy weekly spa and salon appointments? These routine events inevitably lead to friendships among both the staff and the residents themselves. Encourage your parent to go to the café for a light snack, read in the library or just sit outside on the patio. There are always people out and about. All assisted livings host family days with special events for the residents and their families. This is a wonderful way to meet new people. Talking with other families who are going through the same situation can be extremely helpful. Like any new situation, the transition to an assisted living is complicated. But you’ll be amazed how quickly seniors adapt to new surroundings, especially when they are relieved of cooking, cleaning and housekeeping responsibilities. Give it three months and I suspect one day you’ll be pleasantly surprised to see your mom or dad are introducing new friends. In fact, he or she may even cancel plans with you because of a busy social calendar. Now, wouldn’t that make you feel good? Send questions about senior issues to rick@assistedlivingnationwide.com, call 617-513-7067 or mail to Senior Solutions, 27 Congress Street, Suite 501, Salem, MA 01970. Rick Weisberg is president of Assisted Living Nationwide, a firm that helps seniors and their families find the most appropriate assisted living facility, based on the family’s criteria. There are no fees for his services. Rick is also a realtor and is affiliated Benoit Mizner Simon & Co. These days, everything has an abbreviation. CCRC is short for a Continuing Care Retirement Community. These properties consist of an Independent Living Residence, Assisted Living Facility (ALF) and a Skilled Nursing Facility (SNF). The prevailing theory of a CCRC: seniors could have access to a continuum of care as they age – and their needs change over time. It’s an appealing concept on many levels, but let’s delve into these communities a bit more. First of all, you need a good size parcel of land for three buildings. In addition, you need a large staff to care for all the residents. Sate licenses are also required for the ALF’s and SNF’s. Moreover, research has shown that many residents of the independent living facilities do not like the idea of ALF and SNF’s on the same campus. Instead, many seniors are choosing independent-only properties. As a result, there are not many CCRC being built today. In terms of cost, the original CCRC’s utilized the “buy- in” model, not rentals. A large deposit was required (up to $250,000. which was 90% refundable when the apartment was resold) plus a monthly fee. The buy-in model is not used very often these days; most CCRC’s have changed to a monthly rental format. CCRC’s were built for individuals and couples who wanted to move into a residence while they were still independent and would never have to leave the community. On paper, it is an attractive model. The reality, however, is that the overall expense and logistics have limited the number of CCRC’s in the country. Assisted Living Nationwide maintains a list of all the CCRC’s throughout the United States. This model of care is definitely an alternative to assisted living facilities and could very well be the best choice for some seniors. The average cost for an 8 hour day care at home on a daily basis is approximately $5000 a month. In addition to this cost, the couple would still assume the fees of associated with owning or renting a home (e.g. heat, electricity, water, taxes etc.) as well as necessities such as food, transportation, housekeeping and so forth. The couple remains in their own home, where they feel comfortable and can maintain an independent lifestyle. The spouse who can live independent assumes responsibility for such things as maintaining the house/apartment, shopping, errands and driving to medical appointments. Moreover, round-the-clock 24 hour care is extremely expensive, so there will be periods where no help will be available. He or she may also feel isolated from friends and every day social interaction. The average cost of ALF apartment for a couple in the US is approximately $5500/month plus $1500 (fee for second person) or approximately $7000/month. Higher cost than living at home with help, although one needs to add into the mix that cost of the apartment, food, amenities and activities are included into the monthly fee. Most couples want to stay in their homes as long as possible — and that is understandable – and certainly desirable. The key is to figure out when it becomes too stressful for the couple to live alone and, even more importantly, when safety concerns arise. As individuals age and memory loss becomes more pronounced, assisted living facilities can offer support while maintaining independence. Assisted Living Nationwide helps examine the pros and cons of each situation and offer professional expertise to help families make this most difficult decision.